Committed to supporting economic development and educational opportunities in Hampden County, the Massachusetts Green High Performance Computing Center (MGHPCC), recently received a grant from PeoplesBank to provide local students with a free, unique summer camp experience combining rowing and computer programming. During one of two week-long sessions between July 16 and 27, students ages 9 to 14 participated in coding and robotics projects in the morning, rowing and kayaking on the Connecticut River after lunch, and digital and offline activities from Minecraft to ping pong at the end of the day. The Holyoke Codes and Rows Summer Program brings together Holyoke Codes, an education and outreach program of the MGHPCC in partnership with local IT educators and professionals, and Holyoke Rows, a non-profit community organization located at the Jones Ferry River Access Center along the Connecticut River with a mission to provide rowing opportunities for as many community members as possible. 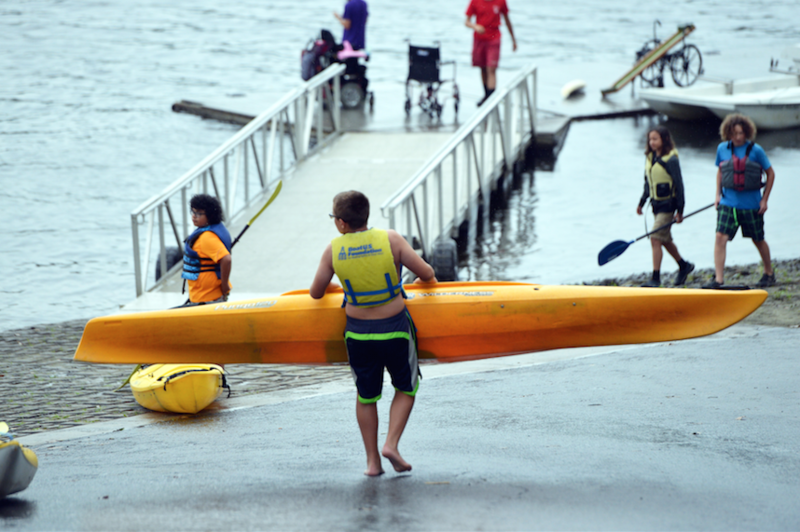 This is the second summer in which the MGHPCC has offered the coding and rowing program. “Having been involved with the creation of the MGHPCC through financing the renewable energy hydroelectric project that made the center possible, and also having an ongoing interest in the health and education of the youth of our hometown of Holyoke, we are proud to support the Codes and Rows program,” said Matthew Bannister, First Vice President, Marketing & Innovation, for PeoplesBank. Holyoke Codes provides opportunities for kids to be involved in coding, robotics, and technology. Technology skills are an important part of being literate in today’s society. We provide access to resources and tools to develop technical skills, and we introduce the material in an accessible, supportive environment that ensures successful experiences. We encourage people to develop creativity, abstract thinking, systematic reasoning, collaborative working skills, and confidence so they will thrive in any environment.